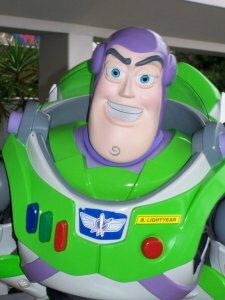 Going Beyond the Phoneme…to the Word and Beyond! Reprinted with permission from Back to Basics | March 2016 Hearing Review. Published on February 19, 2016. Clinically, one may see a bilingual client and wonder whether there should be a different set of electro-acoustic parameters for the two languages of interest. Some research has been performed in this area and most has been summarized by measures such as the Speech Intelligibility Index, or SII. The SII has been used widely, quite often as a tool in the clinical assessment of hearing aids. The SII tells most of the story, but is far from the entire picture. The SII, as implemented in some clinical real-ear measurement devices, is typically based on English and not other languages, and it also provides no direct information on important syntactic items in a sentence that may have inherently low speaking intensity. That is, whereas the SII can provide information on the various speech sounds or phonemes, it does not provide information on word-level and sentence-level cues that may be very important as well. An example of a word-level issue is Japanese, and to a lesser extent, Vietnamese, where a typical word may consist of a consonant-vowel-consonant (or CVC) structure. In order for the quieter consonant following the more intense vowel to be audible, there should be a sufficient rapid compression release time. A clinical suggestion is to implement a quicker release time for speakers of Japanese and Vietnamese versus a fitting for someone with a similar audiometric loss who is a speaker of English. If a person is bilingual, one program can be set for English and another for Vietnamese (with a shorter release time on the compression system). Going beyond the word, we can look at Hindi-Urdu (or Korean, Iranian/Farsi, Turkish, Armenian, Somali, etc) for an example of a sentence-level difference that would not be present on measures like the SII. Hindi-Urdu, like most languages that have a Subject-Object-Verb (SOV) word order, has “postpositions” rather than prepositions that are found in Subject-Verb-Object (SVO) languages such as English. Postpositions (eg, in, on, under, behind) in these SOV word-order languages may be sentence final and, as such, would be of low intensity. Figure 1. 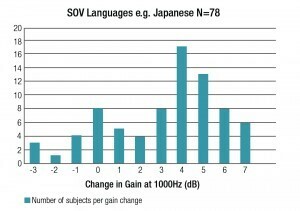 Increase in gain desired for soft level sounds for Japanese/English bilingual speakers for the Japanese program as compared to the English program. Depending on the subject, 3-6 dB more gain for soft level inputs was desired for the Japanese program than the English program. There is nothing specific to these languages about the last word in a sentence being of low intensity (this is a normal characteristic of all speech where we simply are running out of air at the end of a sentence, so the last word or two is of lower intensity); it is that, in SOV word-order languages, the problem is worse. That is, the quiet word final non-noun elements, coupled with running out of air, result in even lower intensity. Postpositions can be linguistically very important, and if they are not as audible because of their position in a sentence, this could have ramifications for intelligibility. A clinical solution to this potential problem would be setting the WDRC circuitry to generate more gain for quieter sounds than for an “English program.” This has been confirmed experimentally1 and data is shown in Figure 1 to support this hypothesis. Soft level speech isn’t just for the quieter sibilant sounds in language; it is also for ends of sentences, especially in those non-English SOV word-order languages. The SII can provide information on the phonemes of a language, but one needs to go beyond the phoneme to the word and the sentence as well. Chasin M. How much gain is required for soft level inputs in some non-English languages? Hearing Review. 2011. (9): 10-16.